Hamilton Steel Products of Chicago manufactured a popular series of pedal-drive Jeeps during the 1950s and 60's. They even made an operating tow truck Jeep starting in 1958, for those times when roadside assistance was needed. The text in a full page advertisement (60K GIF) for the Hamilton No. 808 Tow Truck reads, "The thrill of actually pushing another car with the large front bumper, hanging on to the side of the two hand rails, will be a thrill that comes only once in a lifetime." Perhaps a slight exaggeration, and this also seems to admit that pedal power alone wouldn't be capable of moving two cars. The high hood design, based on the CJ-3B, allows lots of knee room for pedalling. The Hamilton tow truck in this photo was restored by pedal car collector Len Dunn in British Columbia, and includes the fender-mounted horn. 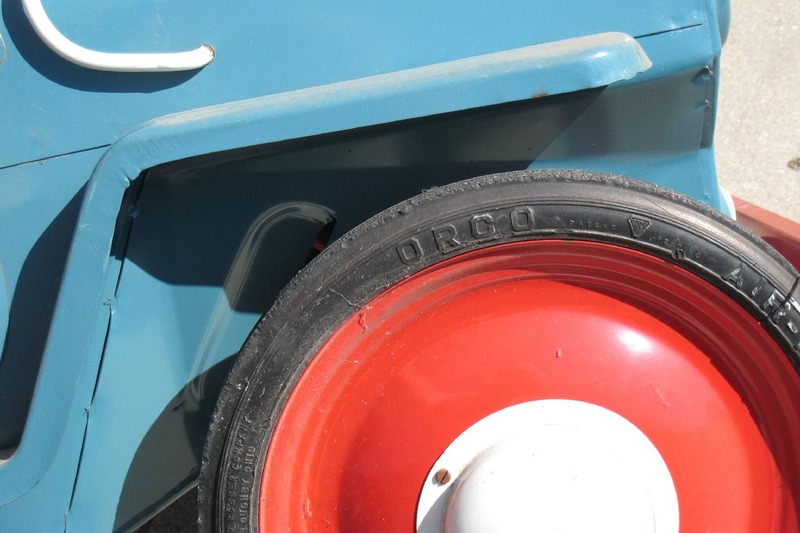 See a photo taken by Len before the restoration (40K JPEG) and a rear view (80K JPEG) of a nice unrestored example. Len has also restored a No. 802 Highway Patrol Jeep which features a microphone with a small loudspeaker behind the front grille. Examples I have seen are white, but a full-page ad (150K JPEG) shows the Highway Patrol Car in yellow. This illustration from another ad aimed at retailers, shows the No. 800 U.S. Air Force Jeep, probably the most popular of the Hamilton Jeeps. See also a beautiful full-color catalogue page (200K JPEG). 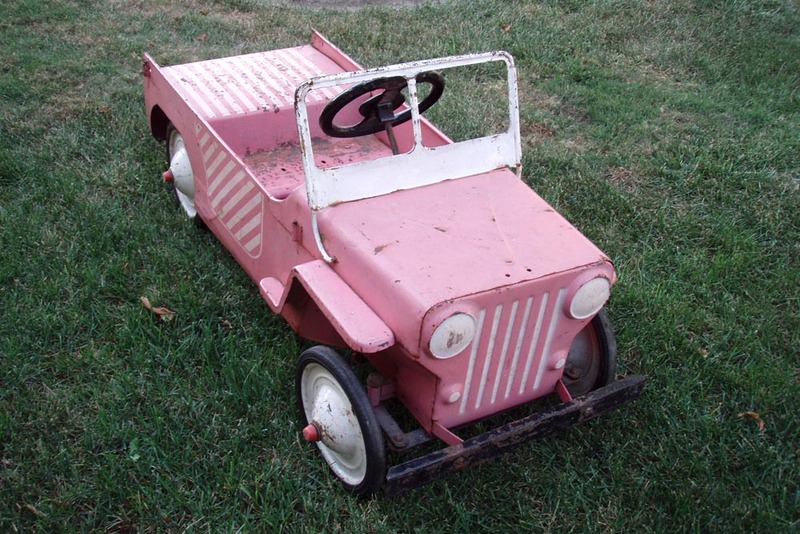 Laura Walesch mentions, "I have a pedal Jeep that I am fairly certain is a Hamilton. The Jeep is all blue including windshield surround, like the advertising picture. It has graphics on the sides that say USAF 93521 (partially worn off, so I'm guessing). What I found perplexing is the fact that it has a plastic (bakelite?) gun mounted on its hood. 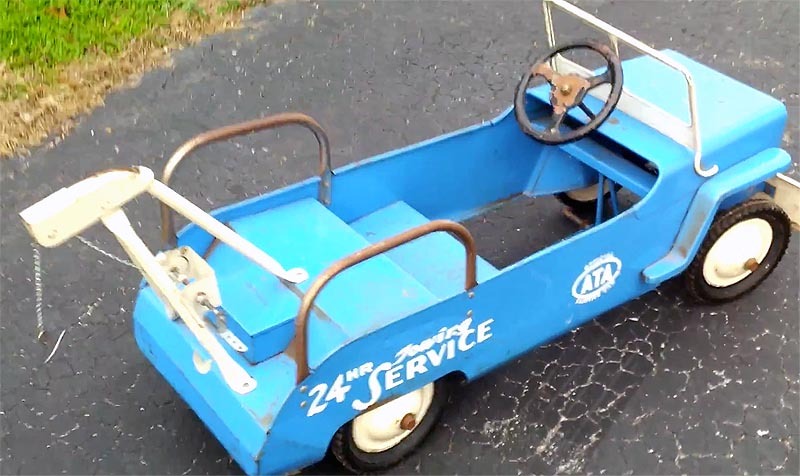 I have been unable to locate any information about a Hamilton Jeep pedal car with a gun. The gun appears be be the same vintage as the car, and is mounted on a rotating base." A nice 1957 color photo courtesy of Ray Law in Florida shows him as a young boy in an all-grey version. The more-commonly-found paint schemes appear to be blue with white windshield (60K JPEG) or black windshield (20K JPEG). Body dimensions are 42" x 16" x 21" high. The Jeep was produced with reciprocating drive (30K JPEG) and chain drive (30K JPEG). An exploded view (50K GIF) shows the parts of the steering and the reciprocating drive system. 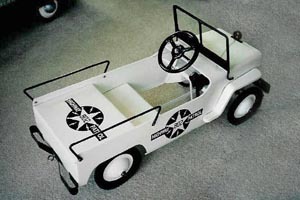 The Air Force Jeep has the unique distinction of being perhaps the only toy Jeep which has in turn had a toy made representing it. 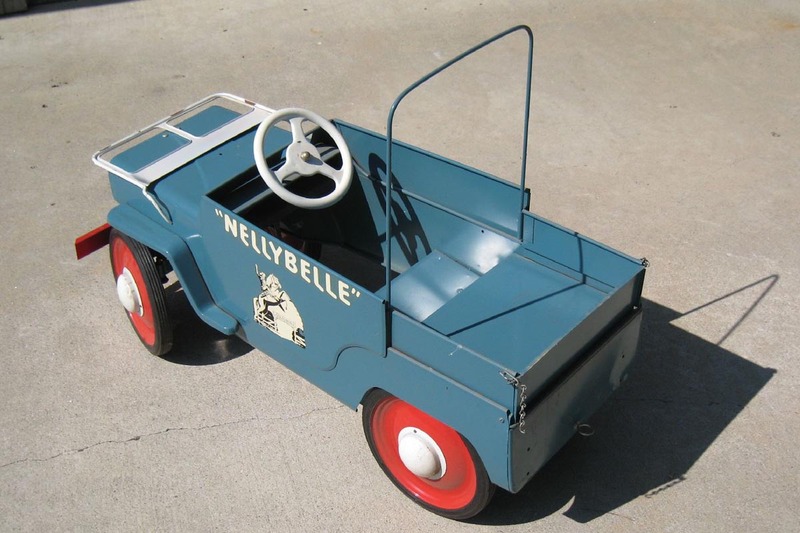 This cast-resin pedal car replica (30K JPEG) is about 3-1/2 inches long. See also a top view (50K JPEG) of the replica. Thanks to Jarek Skonieczny for the photos. 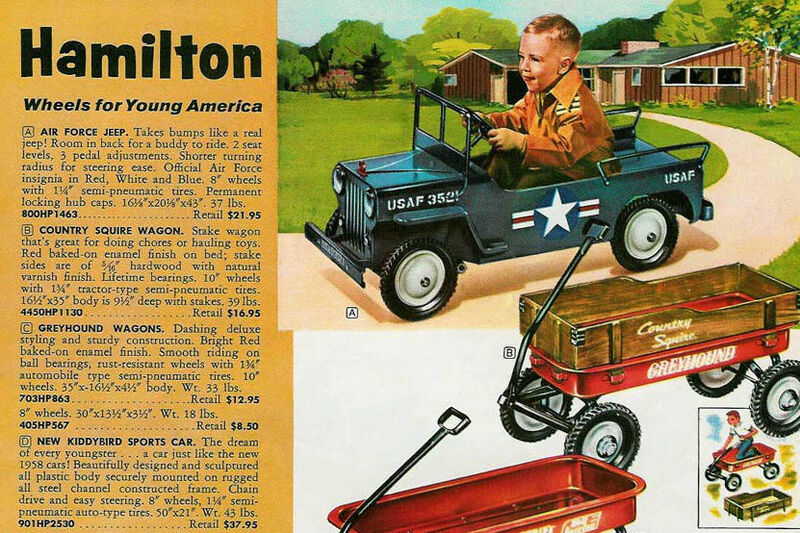 This page from a Hamilton catalogue shows the Fire Patrol Jeep. 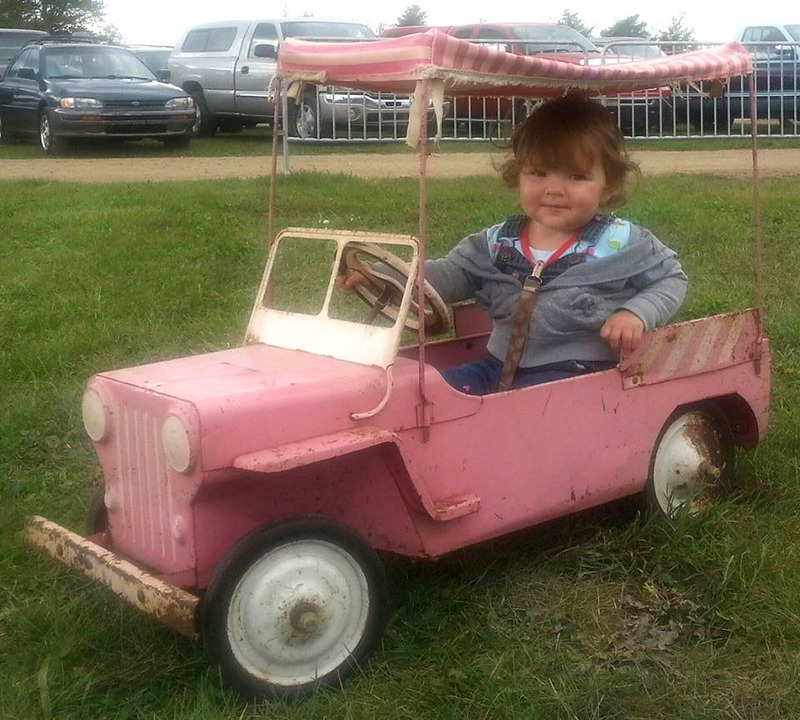 For photos and details, see Pedal-Drive Fire Jeep Toys on CJ3B.info. Also shown is the Jeep Surrey, a Hamilton variation based on the DJ-3A Surrey Gala. It's hard to find, especially with the fabric Surrey top still intact. This 2013 photo is courtesy Anna Cinammon. The only structural differences on the Surrey appear to be the side panels, and the bow sockets welded front and back on each side to hold the two bows for the top. They can be seen clearly in a right side photo (200K JPEG) by Mark Smazik. 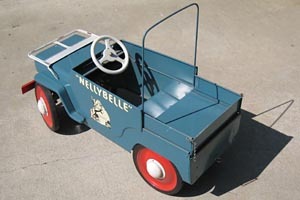 Hamilton also produced a Roy Rogers "Nellybelle" Jeep starting in 1954, featuring unique bodywork and a top bow. This nice example may have had some paint restoration, because the front bumper (230K JPEG) has been attached backwards. 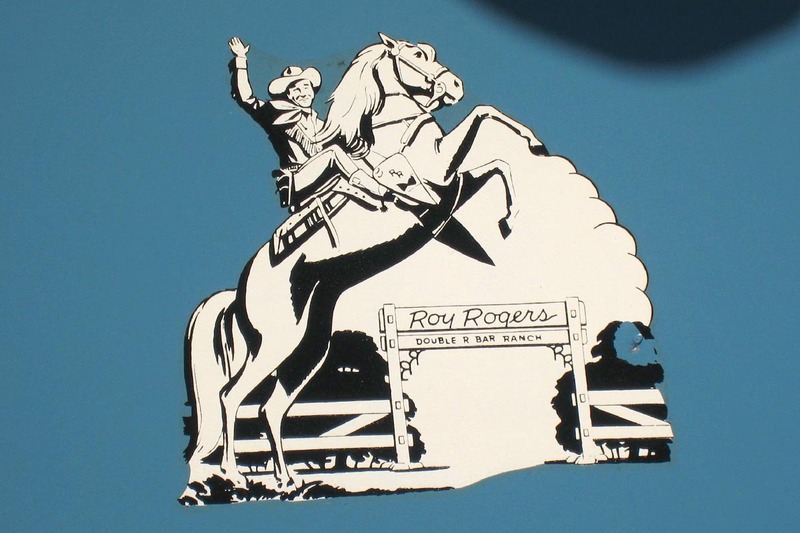 Decals provided Nellybelle's name, plus a drawing (130K JPEG) of Roy on Trigger. See also a closeup of a rubber tire (120K JPEG). Photos courtesy Michael Watson. See more details in Nellybelle Toys. The No. 803 Army version made by Hamilton seems to be less common. Perhaps the company decided that other manufacturers, who produced many jeeps in olive drab, were saturating the market for them. (See Pedal-Drive Jeep Riding Toys.) This example carries the same "USA 93521" number found on some of the Air Force Jeeps. See also an underside view (25K JPEG) of this version, showing the chain drive. Also on CJ3B.info, see Pedal-Drive Jeeps by other manufacturers. Speedway Motors in Nebraska offers reproduction Hamilton Jeep parts and graphics for restorations.